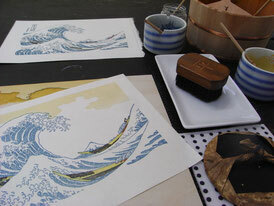 Warmth of the Japanese washi-paper and warmth of the wood, Taste of chisel, Carving makes me forget the time, Gradation printing... It is the potential of representation that can not draw directly! I'm not good at English. Please think me to be a kid and permit my broken English. Thank you very much for your generous-hearted mind. Also, I'm waiting inquiries. I'll respond with my broken English. Printmaking two works "Anthurium" and "Fujiyama"
Gradation printing tecniques : one color-gradation, mixed color-gradation etc.